The LCU is designed to be easy-to-use for commentators, freeing them to focus on their tasks rather than managing the technology. It provides an intuitive user interface for up to three commentators per LCU; Lawo-quality mic pre-amps and uncompressed real-time Audio-over-IP (24 bit/48 kHz) ensure uncompromised audio quality. All activity is indicated in a backlit LCD, indicating each control’s label and its current setting. The unit also features three coordination lines, again with individual volume and pan settings. A “Help” key completes the user interface, giving commentators fast access to a support engineer. For emergency operation, the device provides an analog Mix Out and an analog input to feed the phones’ monitor mix. 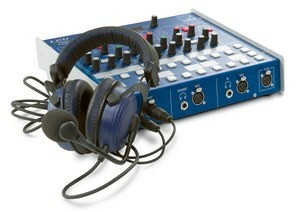 The Aux In can also be used to feed external sources (such as audio recorders) locally to the LCU. The LCU is complemented by the Lawo Commentary Control Software, which replaces the commentary control units usually associated with two-part commentary systems, providing an integrated user interface to operate a complete commentary installation. The software is optimized for touch-screen operation, offering easy and efficient support for up to 20 commentators per screen. It shows the real-time status of all connected devices and manages all LCUs within the network, as well as the system’s DALLIS frame – Lawo’s modular I/O system for interfacing the commentary installation to the outside world. The software also allows a support engineer to listen to any signal of any LCU, while its remote control facilities mean that most help requests can be resolved with a mouse-click.